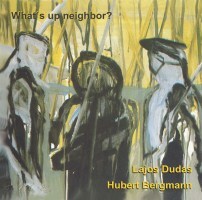 Lajos Dudas and Hubert Bergmann: What's Up Neighbor? 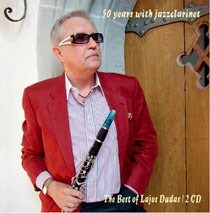 Lajos Dudas and Hubert Bergmann are both experienced musicians, but until 2011 they had never even met, let alone worked together. What's Up Neighbor? is their debut album, an engaging and refreshing duo set of improvisations on clarinet and piano. 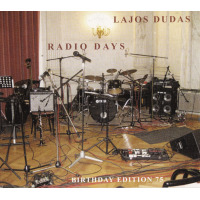 Dudas is an experienced improvising musician with an extensive discography going back to the '60s. Born in Hungary, he now lives in Germany, the home country of pianist Bergmann. The two met for the first time when Bergmann organized an improvised music workshop near Dudas' home, and What's Up Neighbor? is the result of their day in the studio on May 27, 2011. 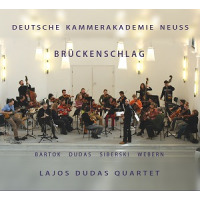 While Dudas' sleeve notes emphasize the improvised and collaborative nature of this music, the composition of each tune is credited to either Dudas or Bergmann, with the exception of "European Study With One Half Hat," which is credited to both musicians. Presumably, this reflects the sources of the original musical ideas before the pair began to explore and extend these ideas through their interactions. The collaborative nature of these improvisations comes over strongly. There is never a sense that the two men are struggling, or fighting to impose their ideas on each other. There are tensions in the music, but these arise deliberately, through the development of atmosphere and mood, as the players spark ideas off one another. As a result, the album has an upbeat, friendly, feel, a genuine sense that this music arises from mutual respect and understanding. The tempos, rhythms and emotions may vary across the tunes, but even the more melancholy passages engender a feeling of positivity and optimism. 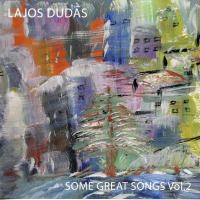 Dudas' "In Memoriam György Szabados" is named for the Hungarian free jazz pianist who died in June 2011. 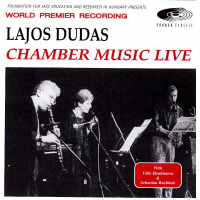 The tune skips and jumps, with Bergmann's jagged rhythm contrasting Dudas' more spacious and reflective clarinet. "Forgotten Blues Is Like..." shares some of this jagged jauntiness, as does "Bop Bee," which is credited to Bergmann. "The Inner Space Of Silent," another Bergmann credit, brings an uncharacteristic but beautiful phase of quiet meditation, with both piano and clarinet leaving plenty of space between notes. The interplay between Dudas and Bergmann on What's Up Neighbor? is impressive, particularly at such an early stage of their musical relationship. 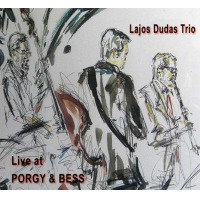 Improvising tunes that are strong on lyricism and melody is no mean feat, one which Dudas and Bergmann achieve with aplomb, and hopefully there will be more collaborations in the future. Track Listing: Eastern Journey; Rootendo; In Gyorgy Szabados; In a Good Neighborhood; Early Morning at Lake Side; European Study With One Half Hat; Forgotten Blues is Like . . .; Bop Bee; The Inner Space of Silent; Chromatic Bubble. 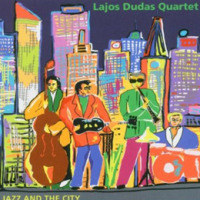 Lajos Dudas and Hubert Bergmann CD/LP/Track Review Lajos Dudas Bruce Lindsay JazzSick Records What's Up Neighbor?